Jalapeño cheese sausage, pork spareribs and house made pickles, jalapeños, carrots, and pickled onions at Willow's Texas BBQ. Photo by Scott Sandlin. Update: Since this article was posted, Willow’s Texas BBQ has relocated their operation just down the street to Shady Acres Saloon at 1115 West 19th Street in The Heights. Willow’s Texas BBQ is anything but a newcomer to Houston-area barbecue. Pitmaster and proprietor Willow Villareal developed a loyal following after a long stint doing Sunday barbecue pop-ups at Grand Prize Bar in Montrose. He also managed the barbecue concession at Typhoon Texas water park during its first summer of operation. Further enhancing his mastery of meat credibility, Willow has taken home back-to-back Golden Cleaver awards as people’s favorite at the first two Butcher’s Ball events at the Rockin’ Star Ranch in Brenham, Texas. 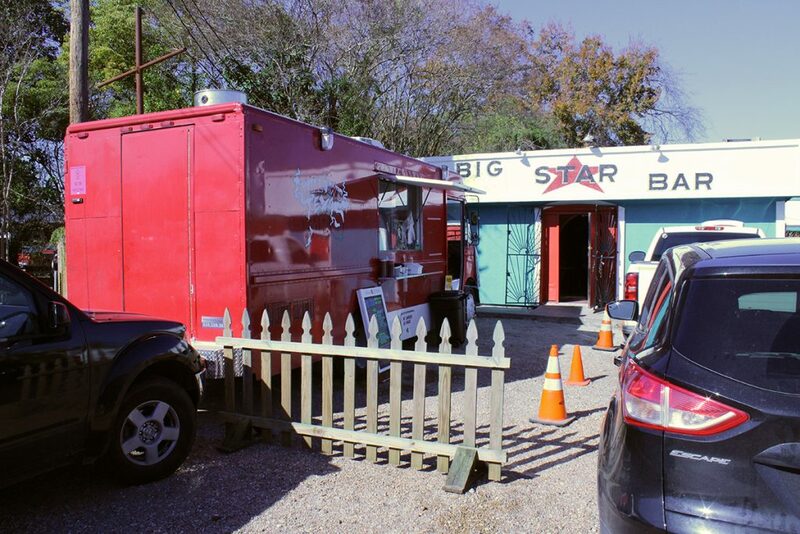 Villareal and his partner-in-crime, Jasmine Barela are now serving from a bright red concession truck at Big Star Bar at 1005 West 19th in The Heights area of Houston. Hours are every Thursday through Sunday from 11:30 a.m. until sold out. Around 8 p.m. he switches to a nighttime menu that features bar food dishes created from his smoked meats and other ingredients. Meats are smoked in Willow’s prep and pit trailer parked in back of the bar. The trailer is outfitted with a post oak-fueled Smokemaster convection cooker made by J&R Manufacturing of Mesquite, Texas. Willow’s Texas BBQ at Big Star Bar. Photo by Scott Sandlin. Willow’s barbecue items include USDA prime brisket, pork spare ribs, smoked turkey, jalapeño cheese sausage and pulled pork. These are available market style (by weight) or on a combination plate with two sides. A one-meat plate is $13, two-meat is $15, and three-meat is $17. Prices per pound are $20 for brisket, $16 for ribs, and $14 for pulled pork, turkey and sausage. Sandwiches with a choice of meats are $8 each. Side dishes are $3 each for an individual serving. The options include charro beans, spicy creamed corn, green beans with bacon, mustard potato salad, and occasionally a cauliflower au gratin or collard greens with pulled pork. 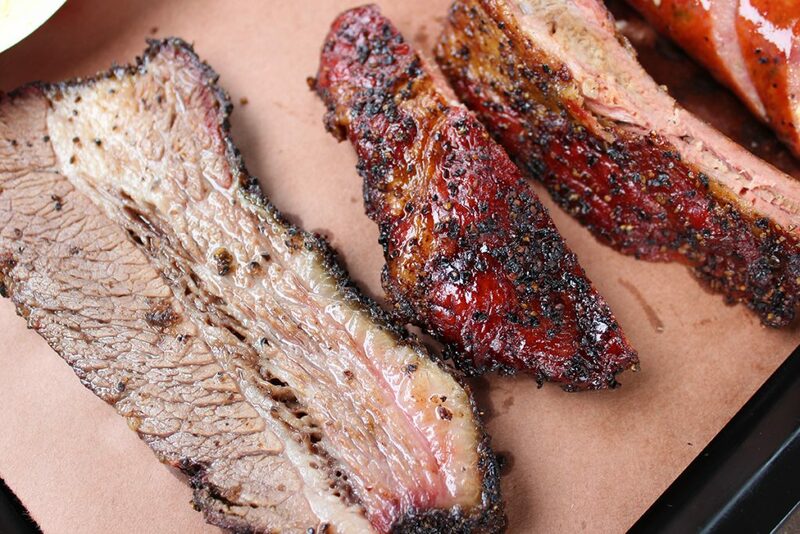 The prime brisket is seasoned with a traditional Central Texas-style combination of spices, salt and coarse black pepper and achieves a modest but appropriate level of smokiness from its time around smouldering post oak wood. The time in the “smoke bath” is perfect for the brisket, with the point being well-rendered and fork-tender, while still maintaining a respectable level of moisture in the flat (or lean). The pork spareribs are meaty and cooked until they yield with just the right amount of pull from the bone. The seasoning combination includes some of the same coarse black pepper as the brisket, providing enough spiciness to complement the rest of the components in the rub without overpowering the natural pork flavors. Prime moist brisket from the point, plus a couple of St. Louis cut pork spareribs. Photo by Scott Sandlin. The smoked boneless turkey breast is juicy and gets a simple blend of light seasoning and coarse black pepper. The jalapeno sausage Willow is currently serving is Slovacek’s brand, from Snook, Texas. The pulled pork stands well enough on its own, but why wouldn’t you try it on a sandwich with Texas toast and The Flaming Lips Slaw? The slaw is a purple cabbage-and-carrot blend that includes The Flaming Lips Three Drops of Death Hot Sauce, a local Houston product made by Big Daddy’s Sauces. Ingredients include habaneros, pineapple, ginger, apple cider vinegar and, for another local touch, Saint Arnold Fancy Lawnmower beer. The sides and condiments at Willow’s are Barela’s creation. Charro pinto beans are loaded with onions, tomatoes and peppers. The spicy creamed corn foregoes the typical mild poblano pepper found elsewhere and incorporates jalapeños instead. The result is a deliciously spicy and creamy blend that complements all the smoked meat offerings without being overly hot. The green beans are fresh, blanched and sautéed with a hearty amount of bacon and onion. Potato salad is the traditional mustard variety most will find familiar and agreeable, but not particularly remarkable. 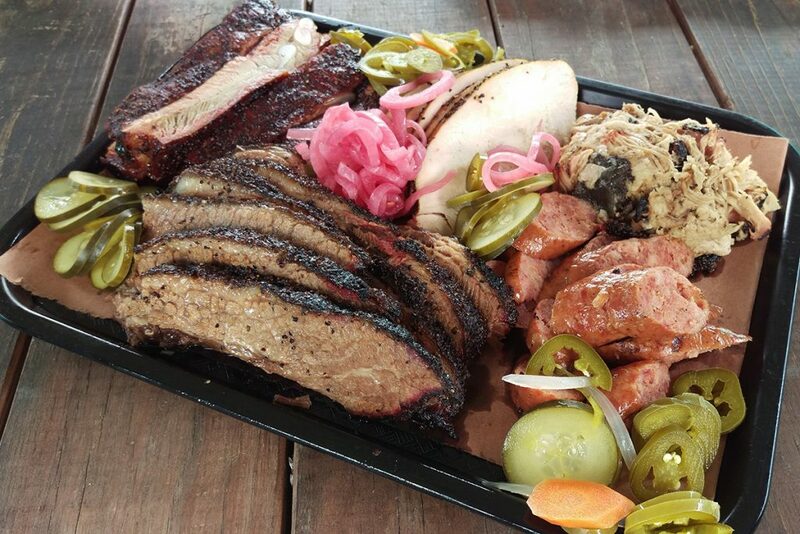 Four-meat platter with brisket, pork spareribs, smoked turkey, and sausage, with housemade condiments. Photo by Scott Sandlin. To experience Willow’s creative side, hang around for the evening when he rolls out his Night Menu starting around 8 p.m until 11:30 p.m. Tacos with your choice of meats are available, and include cheese, a barbecue sauce aioli, and pico de gallo, with a side of charro beans (one for $4, two for $7, or three for $10). Or try the popular Brisket Hug, (featured on a recent episode of the Travel Channel show Food Paradise), with coarse-chopped brisket, lightly sauced, and topped with pickles and pickled red onion, sandwiched between a glazed jalapeño cheese donut from local bakery Hugs & Donuts, for $10. Loaded monster baked potatoes are also on the menu for $9, as well as his sandwiches with choice of meat for $8. Frito pie topped with brisket chili or Willow’s popular vegan chili is $7, and includes pico de gallo and cheese if that’s your thing. Rounding out the night menu favorites are Willow Wings, smoked-then-fried, and tossed in a jalapeño beer butter sauce, six wings for $7. Pulled pork sandwich with Flaming Lips Slaw. Photo courtesy of Willow’s Texas BBQ. Big Star Bar sells drinks to go with the food in both the adult and non-alcoholic varieties. There’s seating inside for those days of inclement weather and plenty of outside picnic table seating. Kids are welcome at Big Star Bar until sundown. Free street parking is available but watch out for private property posted with “no parking” signs. Well-behaved dogs are welcome in the outside seating areas. Willow’s Texas BBQ is no experimental start-up or “hobby barbecue” gig. 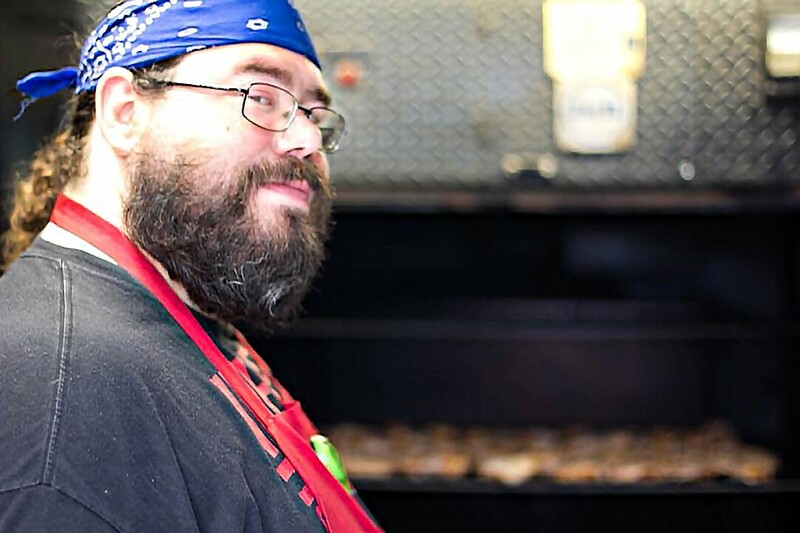 As mentioned previously, Willow has honed his craft over several years in the Houston-area barbecue scene and earned accolades with two significant wins after competition against many top chefs and pitmasters at the Butcher’s Ball. He is just one part of what is making The Heights a burgeoning barbecue destination. Anchored by Gatlin’s BBQ to the west on Ella, and Pinkerton’s Barbecue to the east on Airline, the central part of The Heights is now home to multiple notable barbecue ventures. 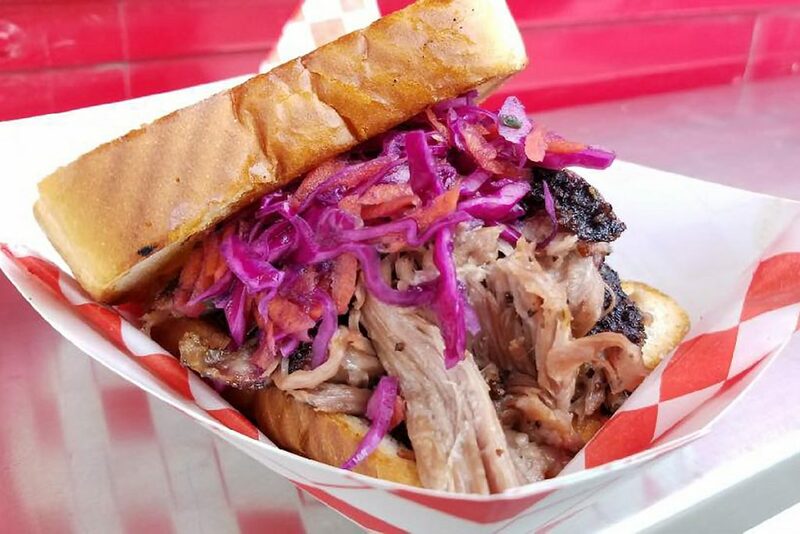 Victorian’s Barbecue is within two blocks of Willow’s and Big Star Bar and every other Saturday, Ugly Duck BBQ is serving at Eureka Heights Brewery. Also, Ellis Brothers BBQ has been setting up occasionally on weekends at Lee’s Fried Chicken & Donuts on Heights Boulevard. 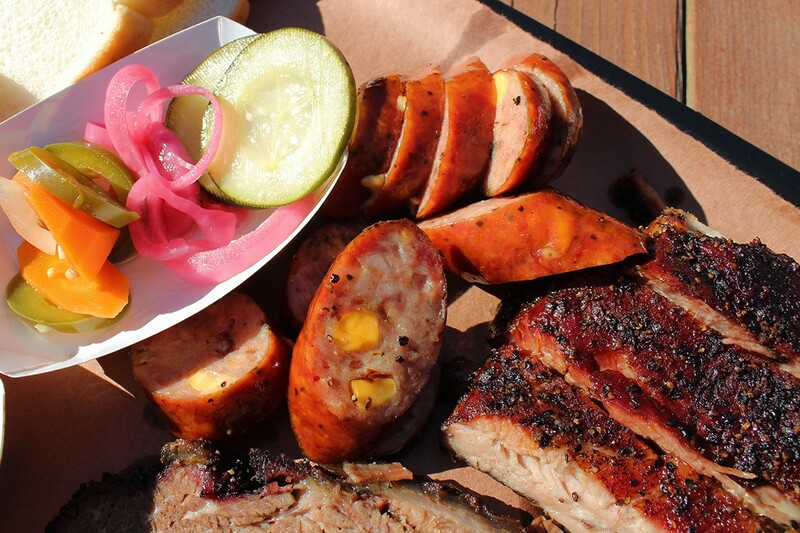 That’s six barbecue spots within a one-mile radius. Make it a point to stop by and see Willow and his crew at lunch at Big Star Bar on Thursday through Sunday or try out his inventive bar food menu in the evenings. Imagination and creativity makes Willow’s Texas BBQ a worthy Houston-area barbecue destination. Willow Villareal of Willow’s Texas BBQ. Photo by Dwayne Cathey. Willow’s Texas BBQ at Big Star Bar, 1005 West 19th St, Houston, 77008. (713) 962-9913. Open Thursday through Sunday, 11:30 a.m. until 8 p.m. or sold out, with Night Menu starting at 8 p.m. until 11:30 p.m. Street parking. Dog-friendly. All costs for this opinion piece were entirely paid for by the author and/or Houston Food Finder. About The Author: Smoked meat enthusiast Scott Sandlin authors the Texas Pit Quest blog, maintains the Guide to Houston-Area BBQ map, and is a freelance barbecue columnist for Houston Food Finder.